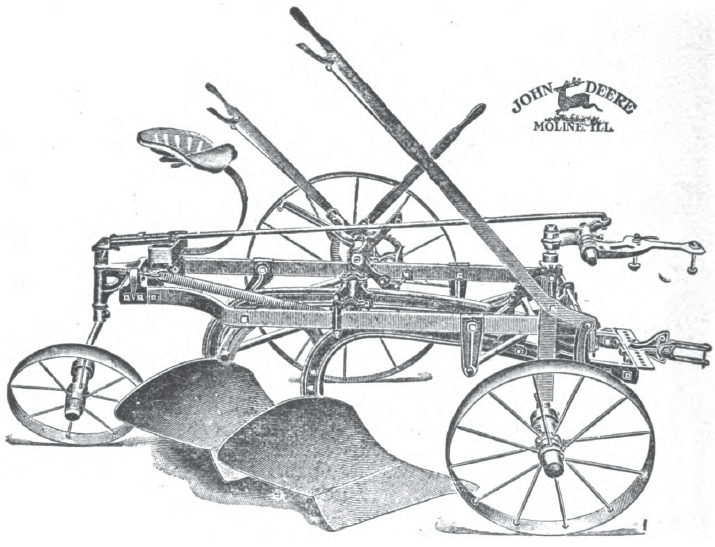 John Deere was the inventor of the modern steel plow. 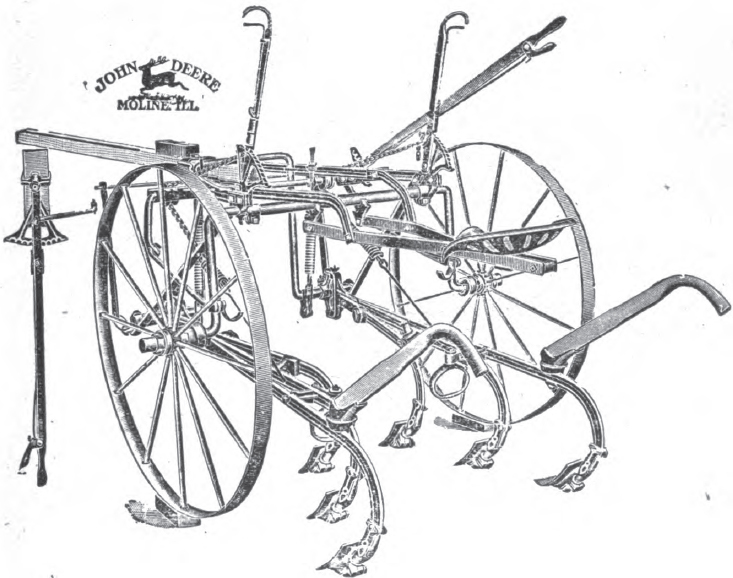 When, in 1837, John Deere located in Grand Detour, Ill., he discovered that a plow to scour in the dark, soft, alluvial soil must be a well-polished steel plow. 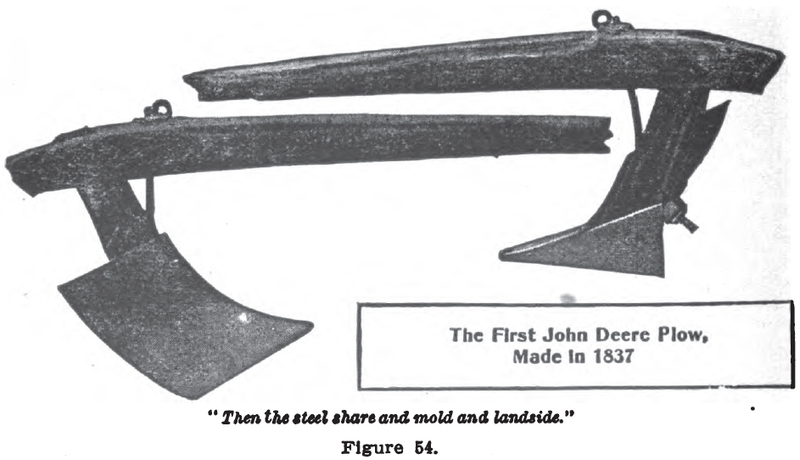 In 1837, John Deere made three steel plows from an old saw-mill saw. One of these plows was found on a farm near Grand Detour in 1901, sixty-three years after it was make. 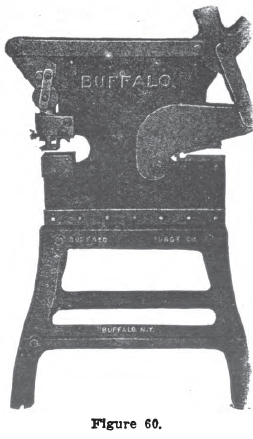 A cut of this plow is shown in Fig. 54, taken from the Central magazine, by Prof. L. R. Whiterell. 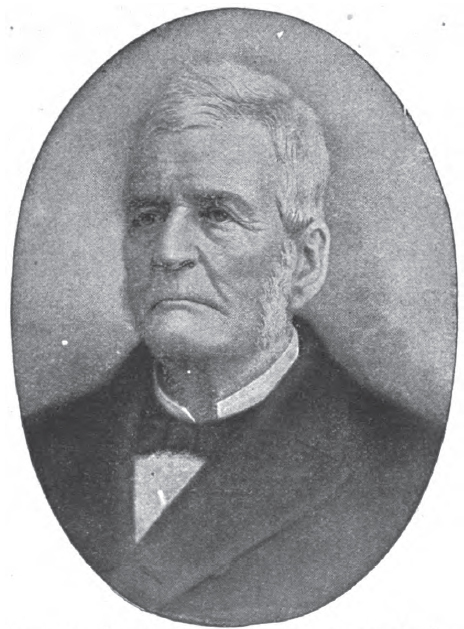 Mr. Deere continued to improve on his plows, and finally he could not find old saws enough and of the size; so he got his steel manufactured and shipped from England, and later from Pennsylvania, U. S. In 1847, John Deere moved to Moline, and then started the making of the now famous John Deere plows. Statues have been erected to commemorate immoral men whose only merit has been the destruction of much property and many lives, while the benefactors of mankind lie in graves forgotten and neglected; but this has been the custom by an unthinking ancestry, and it behooves us to becomingly remember the inventors who have made it possible to make ten ears of corn to grow where formerly only one grew. Agriculture is the foundation of our national standing and prosperity, and the men who develop this branch of our industries should be remembered, first, for the mining industry, as well as all other, no matter how great they seem to be, dwarf into insignificance when compared with the product of agriculture. The John Deere stubble plow has brought a great blessing, and been of more use than the machine gun. John Deere’s corn plow has been a blessing, and only a blessing; still it will not be of much an honor to its inventor as the Krupp cannon to its maker, which has been made to destroy life and property. The one we honor, and the other we don’t remember; but mankind insists on being perverted and crooked, and it takes sledgehammer blows to straighten it out. Let us erect a statue in commemoration of John Deere. There are very few blacksmiths who can boast that they have made plows, for here, as in everything else, machinery has done away with the trade. The only thing to be done now is to repair the plow, and the most difficult part to replace is the share. In making a plowshare, prepare the landside point first. It is important, in making the landside point, to have it one-half inch wider than it should be when finished, for that much material is needed to weld down on, and if the landside is not high enough the share will be lower than the mold board, and it should be the other way. The landside point should also be fully as thick as the offset against the plate, for, if it is thinner there will be a shoulder against the end of the landside plate, and the dirt will lodge against this shoulder, and interfere with the scouring and run of the plow. The landside point should also have the right concavity or circle; for if it straight, like a wedge, the share will not fit down on the frog, and if it is too much of a cavity-circle-shaped, the share will rest too much or too soon on the end of the frog, but not fit up against it the whole way. The landside is the foundation of which to build the plow, and, if the landside is of the proper shape and size, it will be comparatively easy to make the share. The landside point should also have the right angle in the back-end to fit against the shoulder of the plow, and stand in line with the whole length of the landside. When the landside point is finished, place it in position, and hold it there with a pair of tongs held with the tong rings. Now, the landside point should stand in line with the whole landside, both in regard to the bottom as well as the side. If the mold board is thick on the point, then cut a notch in landside, as shown in A, Fig. 56. If this is done, it will guide in placing the lay when it is welded, and the joint of the lay can be placed even with the joint of the mold board. This is very important, and for two reasons: First, if the share is lower than the mold board, dirt will lodge against the joint, and the plow will not scour, the board will wear off, and this will in a short time ruin the plow. Another important point to remember is to have the joints tight, for, if they are not, dirt and straw will accumulate and interfere with the plow. Now if you cannot use a blank share, take a bar of steel 6 x 1/4 inch, and cut as shown at A, in Fig. 57. Then draw out, and shape as shown in B. Now be sure to have the angle in the share at C, in line with the landside. This is another important point. 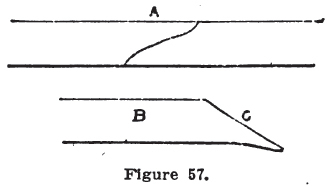 When the share is shaped and sharpened then bend so that the share is at right angles with the landside and edge of lay as shown in Fig. 58. This is the right shape for a stubble plow, but for a breaker the share should be turned up more, so as to leave a gap between the share and the square at least an eighth of an inch. This should be observed in all walking breakers as the mold board in a breaker has not so much turn as in a stubble plow, and for that reason the share should be more curved. In walking lays, the turn in the mold board should be observed and the share curved accordingly. Also, the hardness of the ground should be taken into consideration. A plowshare set for spring plowing, when the ground is soft, should have the edge along the heel turned up more than a share made for fall plowing, when the ground is hard. When the share has been fitted to the landside and the square, – not the brace, as many blacksmiths do, for the brace at the heel might have been bent out of shape and it is not safe to go by that. – then clamp the share on the landside as shown in Fig. 59. Then weld the point first as indicated by the dotted lines. You will notice that the share is longer than the landside point: therefore bend the share over and under the point, and weld. You now have the share “stuck” and in good condition to prepare for the most important weld, – the weld of the joint. Many smiths-yes, most of the-weld at the joint first. Wrong as it is, it still comes easier to do things wrong, and I will now explain why it is better to weld and stick the point first. First, it is easier to get a weld on the point than up at the joint, where there is so much difference in the thickness of the material; second, when the point is welded, you can place the share on the plow, and see if it is a good snug fit before you weld it; and third, you can now heat the share at the joint, and fit the landside and share tight and closely together while it is hot, for if this is not done the blast in the fire will blow cinders in between, and you will never get a good weld. I think this explains the reason why there are so few plowshares found which have a good fit and solid weld. In welding, have a good, large, clean fire. Use borax and sand freely. Go slowly, for if you put on too much blast the steel in the share will burn before the iron in the landside is hot enough. When the weld has been taken, place the share on the plow, and hammer it on snug while hot; then finish up the point. When welded, make the holes and punch with a Buffalo punch. See Fig. 60. When the holes have been punched and countersunk, grind and polish; then it is ready to harden, if it is a soft center; but if it is a crucible or cast steel lay, do not harden.